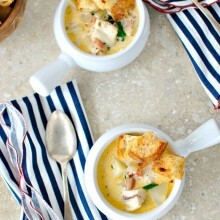 Looking for a warm and cozy soup? 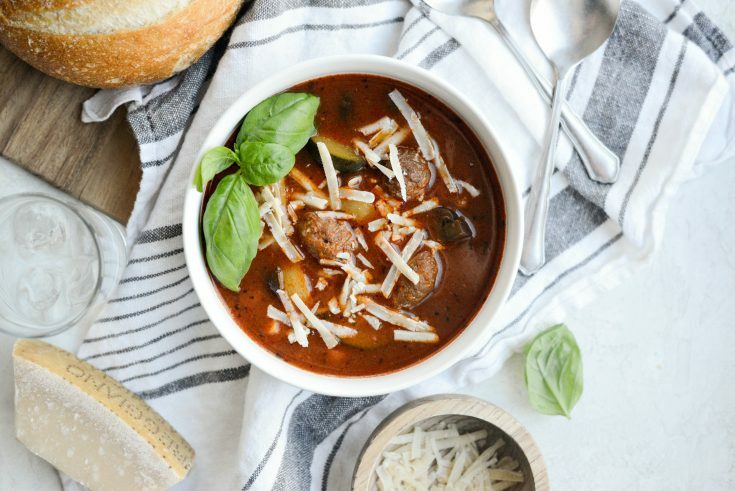 Well this slow cooker Italian meatball vegetable soup is soul warming and scrumptious. Oh, and BONUS! It’s freezer friendly and 95% can be made in advance and frozen. Easily whipped up on a chilly day or when you’re just not in the mood to cook. 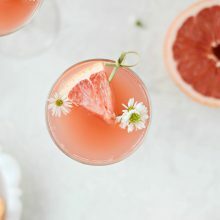 I absolutely love recipes like this! Back in September I made a bunch of slow cooker freezer meals. I spent a whole morning and afternoon chopping, sautéing, flash-freezing ingredients to have slow cooker meals at the ready come January. Okay, actually I planned to post these in October, but that month (and the rest of the year) totally got away from me. PLUS now is the time where slow cooking is my favorite thing on earth. 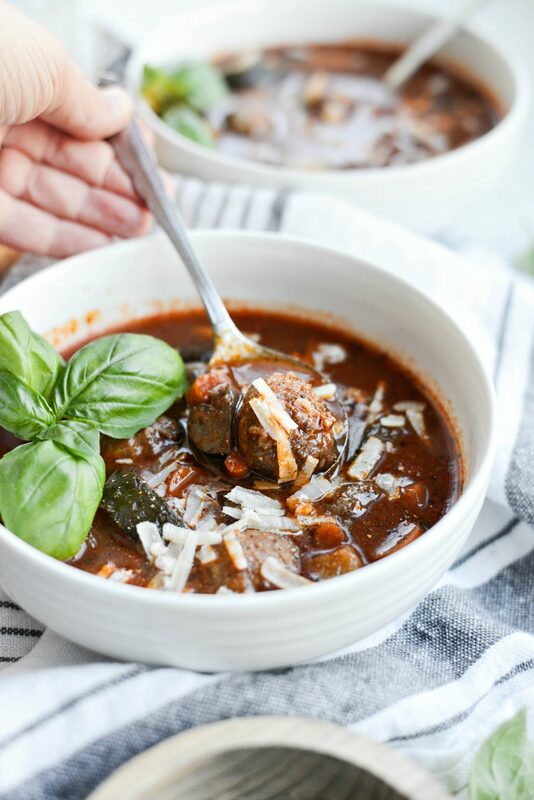 Today I’m sharing with you one of my favorite freezer-friendly, slow cooking soups: Slow Cooker Italian Meatball Vegetable Soup! You know I’m on the fence with most slow cooker recipes. Some are just blah to me. However, not this soup! It definitely doesn’t taste like it was frozen 4 months ago and made in the slow cooker. In this post I’m sharing how I went about making the prep kit. Then I share how I made it from the frozen stage. There is quite some prep involved, so having this freezer kit in the fridge helps. 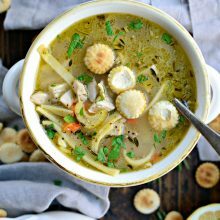 If you wanted to make this the morning of, just add everything, including the broth into your slow cooker and set it on low and cook for 6 to 8 hours. Easy-peasy. Here’s what you’ll need: 1 pound meatballs (about 24 meatballs 1-inch in diameter), dry red wine, marinara – I used the recipe from my cookbook, but you can use this or any marinara you like. You’ll also need chopped carrots, diced yellow onion, zucchini and yellow squash (1 to 2 of each depending on their size), mushrooms, garlic and red pepper flakes. I also recommend writing out the labels (if using them) in advance and placing them on the baggies before adding the ingredients. Write down ingredients that are in the bag, the ingredients you will need day of in order to make the recipe and then any garnishes or ideas for serving, so when you pull out the bag to thaw, you can purchase any ingredients that you don’t have on hand. For me it was basil and crusty Italian bread. For the meatballs I made a batch of my favorite meatballs ever and used a tablespoon scoop to measure out the meatballs and then rolled them into balls. 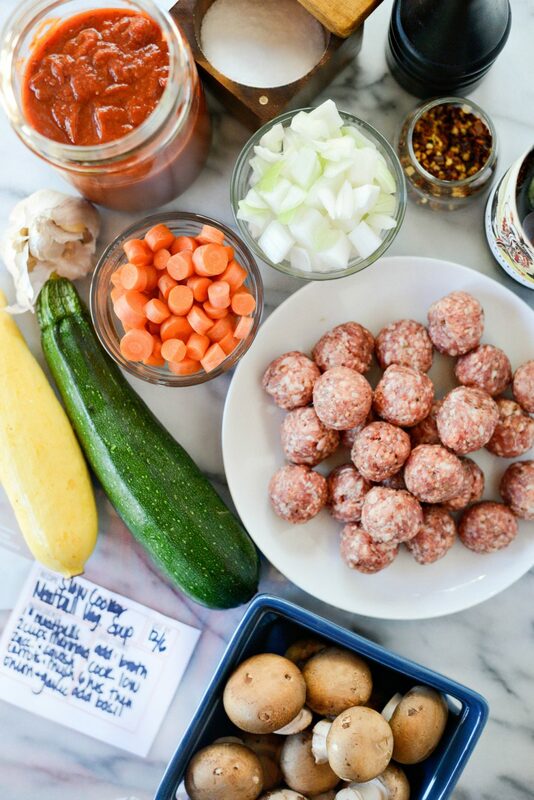 If you by chance have extra meatballs, just flash-freeze them and save for another recipe. To flash-freeze, I place the rolled meatballs on a parchment lined rimmed, metal sheet pan and pop them into the freezer for 20 to 25 minutes. This will help the meatballs hold their shape when added to the freezer kit, so they won’t get smashed. I bought a few of these clip storage bag holders (affiliate) which really helped to hold my gallon ziplock bags upright, so I could add in all of the prepped ingredients. 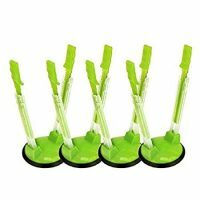 If you’re prepping a few recipes at a time, I would highly recommend buying a few of these babies, they are so handy! 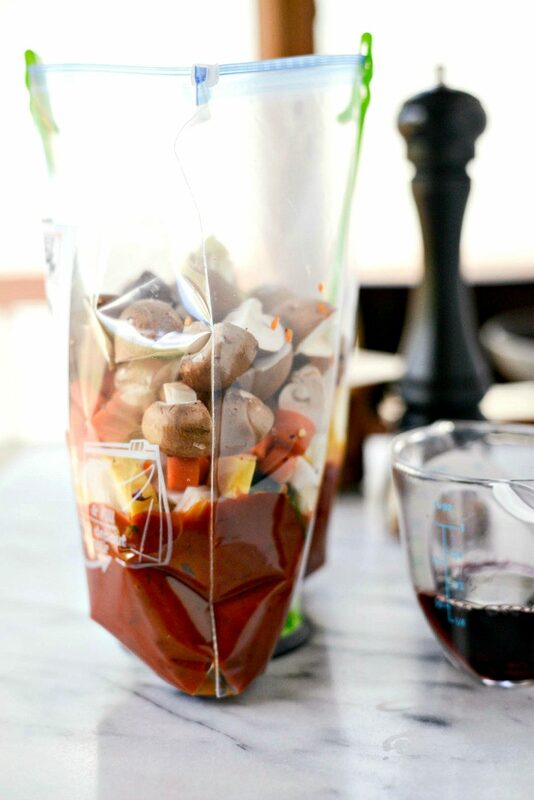 For this slow cooker Italian meatball vegetable soup, I layered in the bag like this: marinara, wine, vegetables, minced garlic, red pepper flakes, and then added in the flash-frozen meatballs. The morning before the day I plan to make it, I pull it out of my freezer and place it into the fridge to thaw for 24 hours at the minimum. I DO NOT recommend adding the completely frozen bag ingredients in to your slow cooker. Doing so may affect cooking times and the outcome of the soup. 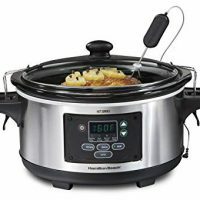 I also read a few opinions on putting food into the slow cooker from the freezer, that the contents might not reach a safe temperature to consume. 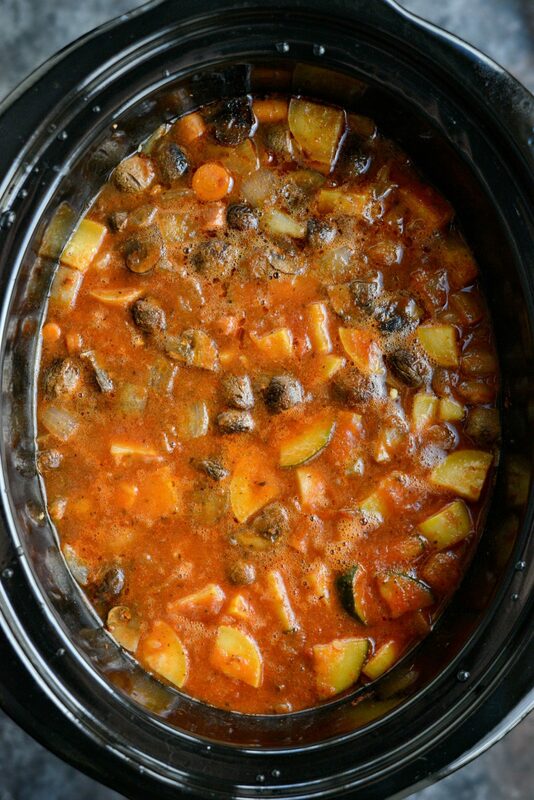 Day Of: Place the thawed (and maybe slightly slushy) ingredients into your slow cooker. 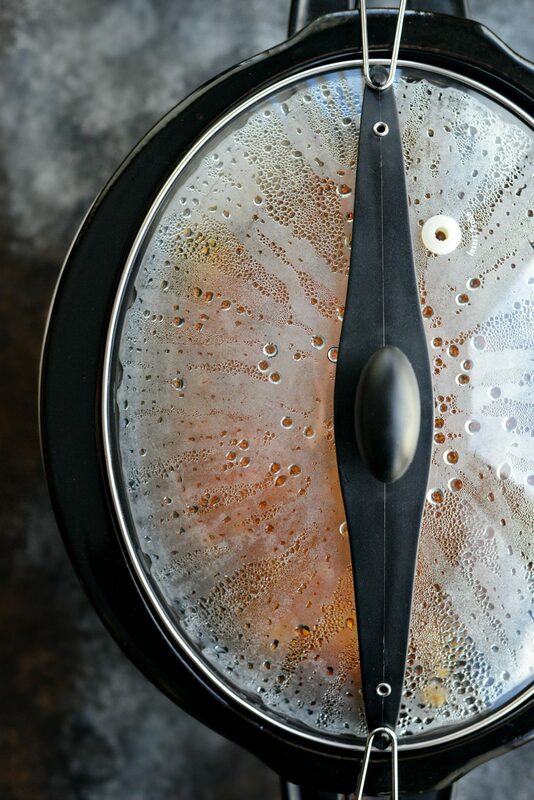 Pour in 1 quart of low-sodium chicken broth and secure your slow cooker lid. Next, set to low and cook for 6 to 8 hours. Once the soup is ready, season with 1-1/2 to 2 teaspoons kosher salt, 1/4 teaspoon freshly ground black pepper. 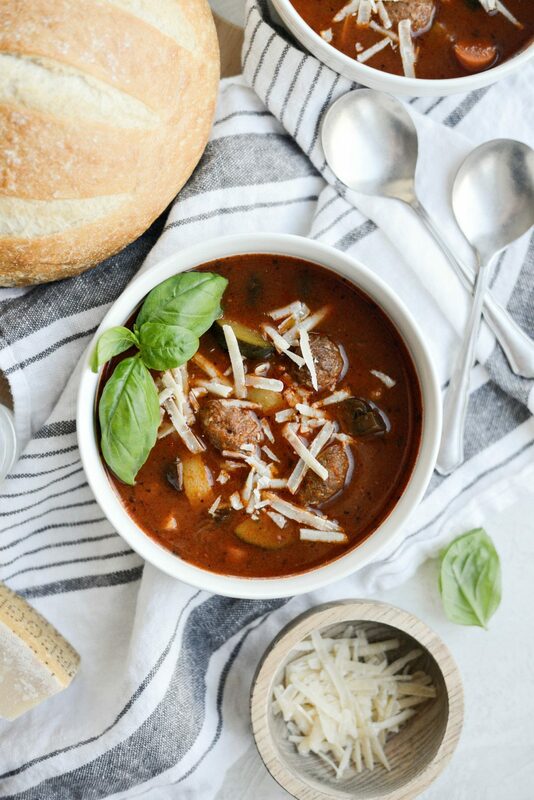 Then ladle the slow cooker Italian meatball vegetable soup into bowls. Serve with freshly grated parmesan cheese, fresh basil and extra black pepper, if you’re into it. Enjoy! 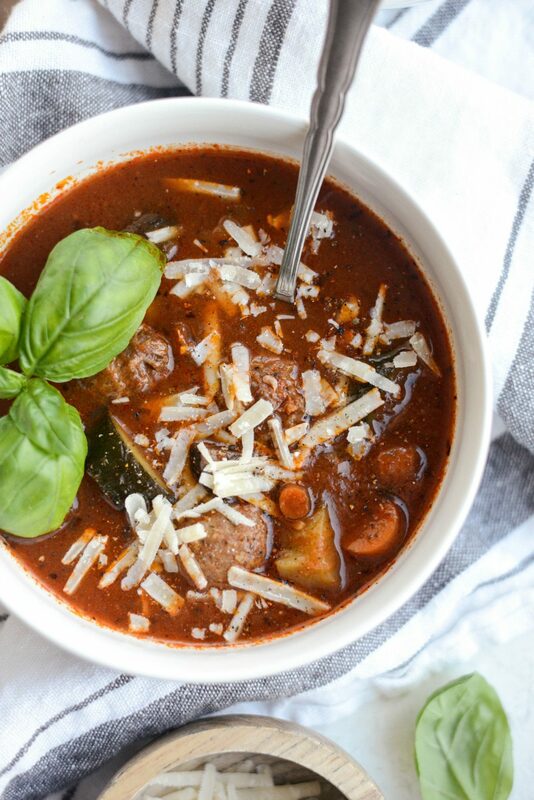 And if you give this Slow Cooker Italian Meatball Vegetable Soup recipe a try, let me know! Snap a photo and tag me on twitter or instagram! 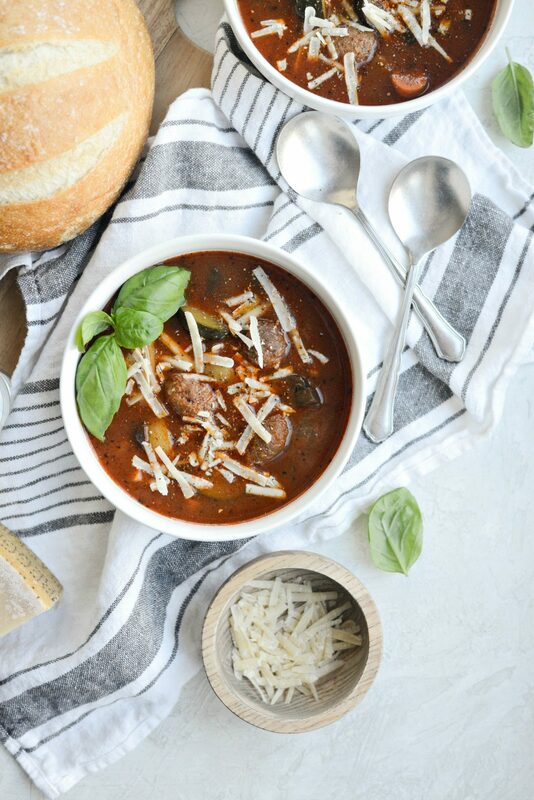 Looking for a warm and cozy soup? 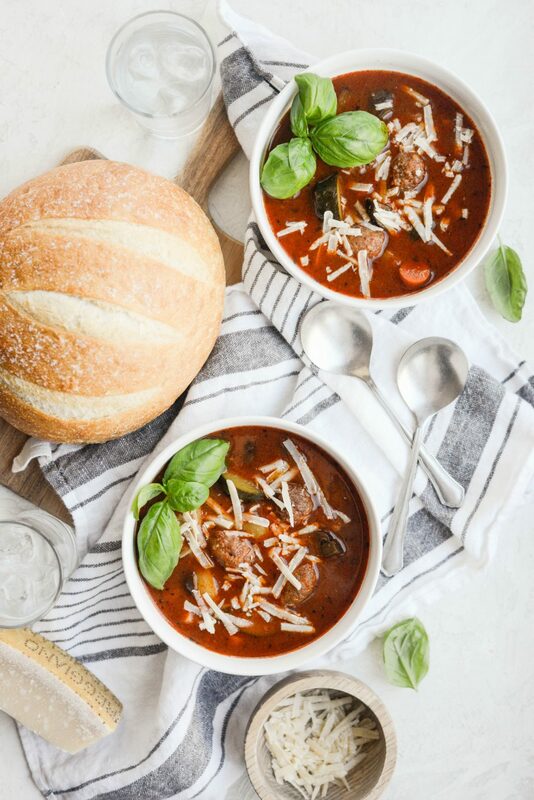 Well this slow cooker Italian meatball vegetable soup is soul warming and scrumptious. Oh, and BONUS it's freezer friendly and 95% can be made in advance, frozen and whipped up on a chilly day or when you're just not in the mood to cook. 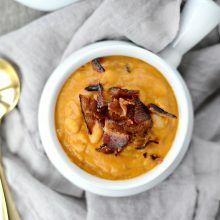 I absolutely love recipes like this! 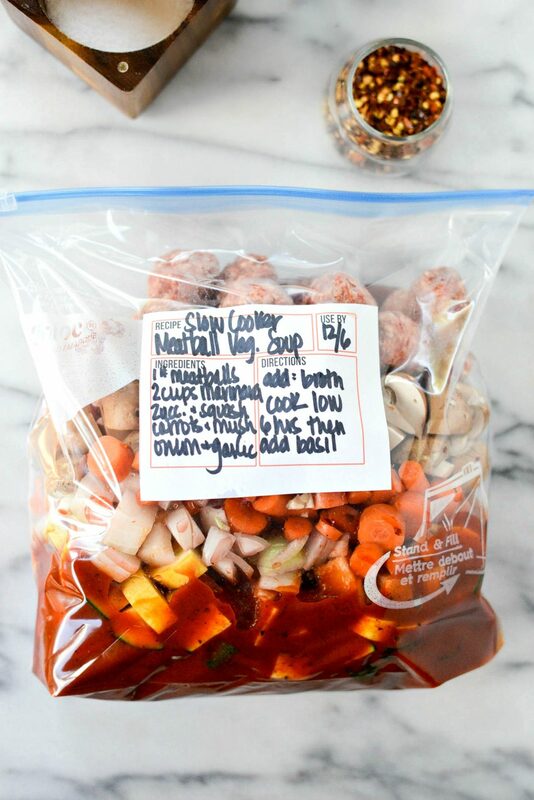 Meanwhile, in a large gallon-size freezer-safe sealable bag, add in the marinara, wine, onion, zucchini, yellow squash, carrots, mushrooms, garlic and red pepper flakes (if using). Add the flash-frozen meatballs and seal half of the way closed. Carefully squeeze out as much of the air as possible before sealing the bag all of the way. Lay flat to freeze, this makes it easier to store and for stacking other slow cooker freezer meals. Store in your freezer for 3 to 4 months, possibly longer :). 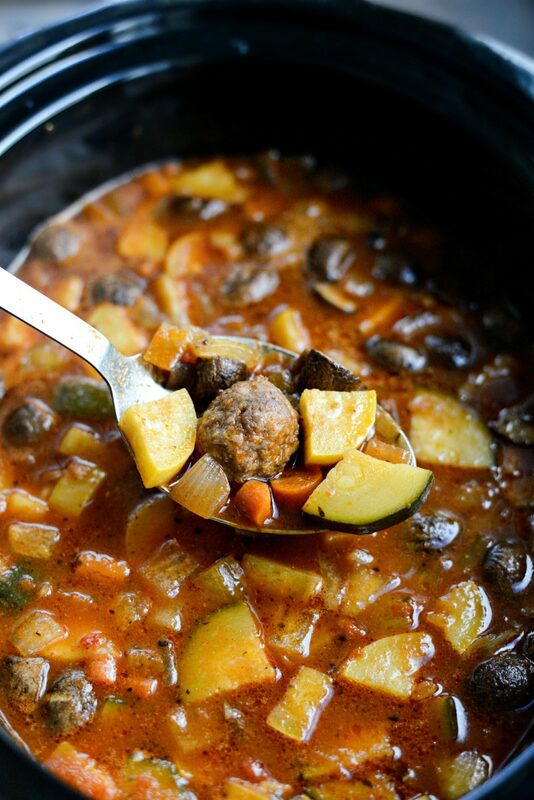 Remove the Slow Cooker Italian Meatball Vegetable Soup bag from the freezer the day before you plan to make it. I found that if I take it out the morning before the actual day I plan make it, it will have plenty of time to thaw out. I DO NOT recommend adding the completely frozen bag ingredients in to your slow cooker, doing so may affect cooking times and the outcome of the soup. Serve with fresh basil, Parmesan cheese and crusty Italian bread. It's handy to label the freezer kit meal with what's in the kit and what is needed the day of, along with any cooking and serving instructions. This looks delicious! And I love those bags, wonder if I can find them down here… I’ll have to look into it. So… I have never used a slow cooker. 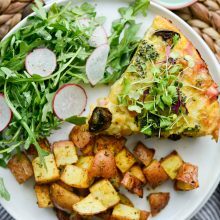 Is there a recipe you would recommend for beginners? Hi E! I would suggest these two: http://www.simplyscratch.com/2016/10/slow-cooker-italian-turkey-meatballs.html and http://www.simplyscratch.com/2016/10/slow-cooker-pork-chops-herb-gravy.html But all slow cooker recipes are relatively easy! Enjoy! 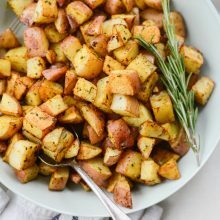 I’m making this for the freezer today 🙂 due to the season, I can’t find yellow squash – can i subsitute butternut squash cubes? Or should I just omit? 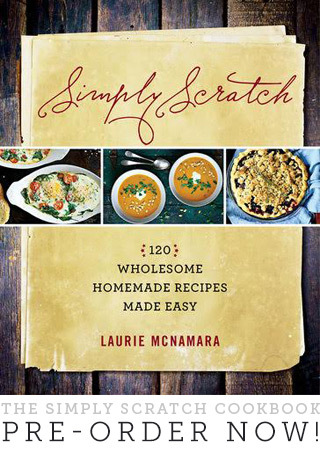 Thanks for the terrific recipes Laurie! You’re a family fav! I made this yesterday and my husband and I both really enjoyed it! I’d never had meatballs in soup before. But they were very tender and delicious. I’ll definitely be making this again. Thanks for sharing! I’m thrilled to hear it, Patricia! Thanks for taking the time to make this recipe and leave a glowing review!